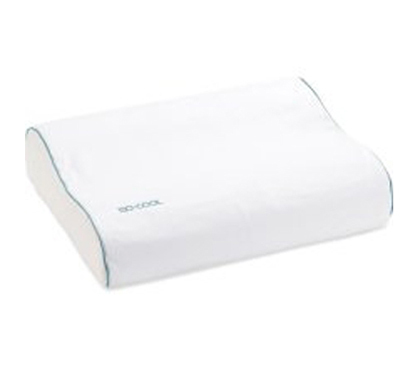 Our Iso-Cool Contour Bed Pillow is all about high quality. If you want the best dorm bedding, then our Iso-Cool Contour Bed Pillow is what you'll want to add to your college bedding supplies checklist. This is much more than just a high quality memory foam pillow! This pillow features Outlast Adaptive Comfort Material, which is designed to keep your head/neck cool all night. Not cold, but cool. You know how some pillows, especially memory foam can generate heat? Well, picture our Iso-Cool Contour Bed Pillow always that cool temperature that you find on the other side of the pillow, (if you've ever flipped it over in the middle of the night). 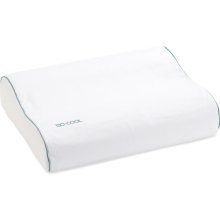 This college pillow helps to create a perfect night's sleep in your dorm room bedding! The Iso-Cool Contour Bed Pillow features 300TC, 100% Cotton Cover, 100% High Density Memory Foam and comes with an impressive 5-Year Manufacturer's warranty. With the 3-Position contour design there is not much more you need to ensure a great night's sleep in your Twin XL dorm room bedding set-up.